Vorshlag Motorsports is proud to offer the full line of Ohlins Road & Track Coilovers. The Road & Track series of monotube dampers has the quality, technology, and performance we look for here at Vorshlag, we won't just sell any damper! Ohlins has been involved in racing for over 30 years and that knowledge and commitment to providing high-end damper solutions can be found in each of their products. We highly suggest adding Vorshlag camber plates for any track use, which gives more front alignment adjustment and saves tire wear on track. Choose the appropriate options and model alterations from the drop down menus below. These options will affect the final price as shown for each option. All optional packages and parts include significant discounts when purchased with shocks rather than buying the parts separately. 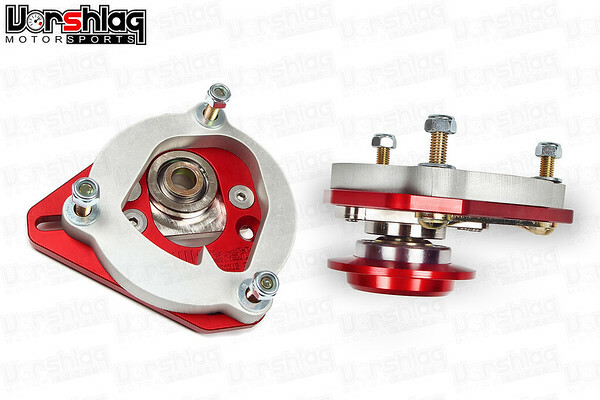 CAMBER PLATES : We highly recommend Vorshlag camber plates be used with Ohlins strut kits, but the shocks can be used with the OEM upper strut mount for racers on an extreme budget. Easily adjust camber track side with Vorshlag camber/caster plates. Over-sized spherical bearings are designed to withstand the rigors of street and track abuse. All components are plated for maximum corrosion resistance and long life. Please see the product entries on this website for more information about the Vorshlag camber plates and perches. Ordering this option includes the associated Vorshlag upper spring perches made to work with these plates. The Ohlins mounting instructions for the Focus RS kit are very detailed. You can access them here in PDF form.